Catalpa, we think, is one of the most showy and impressive summer-flowering trees of the north temperate regions of the world. Our old professor, Mike Dirr, hardily disagrees with us as he lists it as one of the trees he hates. There are many species of Catalpa that find their homes in areas around the globe but it is thought by some that the native North American wildwood Catalpas originated around the confluence of the Ohio and Mississippi Rivers, we really do not know for certain. The name Catalpa originates from the name it was given by the native peoples of North America, Kuthlapa, which means “head with wings”. This name comes from the tree’s botanical origin from seed in which the new seedlings rise like a funny mop head from the center of the seed giving it a real head like appearance with wing like shoulders. The Cree, the Cherokee and other First Nations were aware of the medicinal properties of the Catalpa, which included a decoction from the bark that was used as tea and taken for lung complaints such as asthma and bronchitis. The dry pods were also used as an effective vermifuge to rid areas of parasites including being placed among clothing and linens to keep them free of pests. 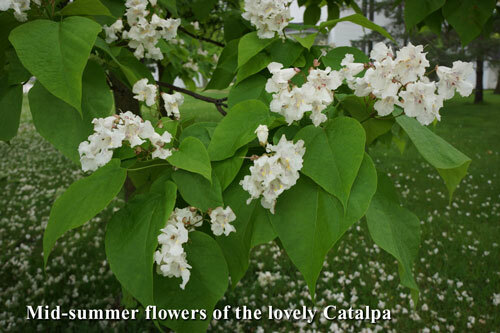 These are just a few of the ways Catalpa was appreciated for its multitude of beneficial uses. The Catalpa is amazingly tolerant of alkaline soils making it a great tree for our suburban landscapes and although it does have flowers that drop and “beans” in the fall, I believe it is a tree that merits greater appreciation in our tree planting palettes. Last night we stayed up past our bed time watching the fireworks display put on by thousands of fireflies just above the prairie. At the same time, we were watching a Great Barred Owl perched on our barn and hunting in our yard. Our neighbors lawns however, sported very few fireflies and no owl. Midwest prairies are the whole reason that the United States is an agricultural power house in the world and yet only 2% of Illinois prairies are being preserved. So, if you want a particularly lively and low maintenance garden, that naturally fits into Illinois history, please consider carving out a small section of lawn and giving it over to prairie. 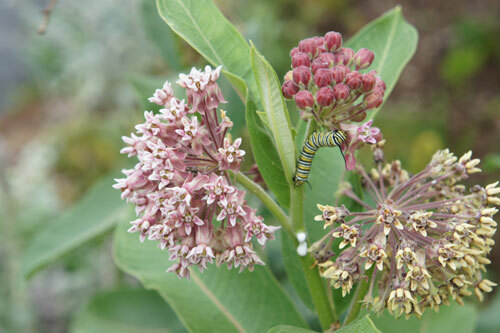 Just 10 feet by 20 feet could provide an island haven for Milkweed and Monarchs. This is not a big project. You can find books, tools and seeds at The Chalet Nursery in Wilmette. If you want someone else to do it you can contact PC Miller, Landscape Artist in Lake Bluff, or Native Prairie Restoration. Or, you could just stop mowing and see what springs up, that’s how we got started. As an added benefit you can combine your prairie garden with a rain garden that will store, clean, and recapture rain run off from your house, drives, and lawn. Illinois prairie also can sequester as much carbon dioxide, acre for acre, as a tropical rainforest. So, if you can’t plant a rainforest you can reduce your carbon footprint by allowing a bit of prairie to grace your landscape. Have fun and save the world. 2. In a medium bowl, whisk together the flours, flax seed, sugar, baking powder and salt. 3. Add the vanilla, oil and milk, stirring until completely mixed together. 4. Fold in the raspberries and walnuts. 5. Preheat a greased skillet or griddle over a medium heat. When a drop of water sizzles when it is flicked onto the skillet, you are ready to make some pancakes. 6. Pour about 1/2 cup of batter onto the skillet and allow to cook for 2-3 minutes. When the edges are set, flip the pancake and cook for another minute or two until both sides of the pancake are browned. Remove to a plate to partially cool, and repeat with the rest of the batter. 7. Serve topped with syrup or preserves. Many of us have noticed that many of our trees seem to have produced an abundance of fruit, or seeds this year. Last year’s acorn crop was really huge, as well. Why is it that some years we see almost no seeds and others we feel like we are drowning in them? Research seems to indicate that seed production on trees runs in cycles known only to the trees. However, we have seen a correlation between stress and seed production. It may be the tree’s method of reproducing itself if it feels that it’s life has been threatened. Last year’s record setting drought and this year’s record setting rains have set up ideal conditions for the trees to feel stress and then have lots of moisture to push out a bumper crop of future new baby trees. In the photo of the two Silver Maple trees it is easy to notice that the one on the left looks thinner than the one on the right. A close up of the tree on the left shows the exceptionally heavy crop of “whirly birds” or maple seeds. Why did two of the exact same species of tree growing right next to each other produce such different crops of seeds? The root damage that is caused by both drought dry out and drowning from flooding causes real, long term stress on a tree that can last for many years beyond the event causing the stress. So the tree on the left was obviously responding to that stimulus and putting out a big crop of seeds to insure the future of the species. Another lesson in the life of our amazing trees whose wisdom is always teaching us new things. Important correction for Arborsmith Tree Calendar users: We misprinted the date for Thanksgiving this year. It should be November 28th, 2013 not the 21st...sorry.